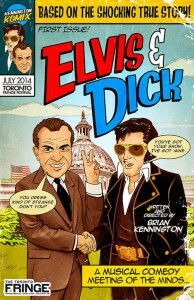 held a meeting with Elvis, where Presley aspired to become a Federal Drug Agent!? Packed with 15 of Elvis’ hits, the musical is laced with the King’s fantasies where he’s clobbering Commies, busting Hippies & infiltrating Women’s Liberation. Everything is true, except for the parts made up! (Toronto Fringe Program, 2014).